Chinese New Year falls on the 28th of January this year. It is the year of the Rooster! The Rooster is tenth in the Chinese zodiac. Each year is related to an animal sign according to a 12-year cycle. 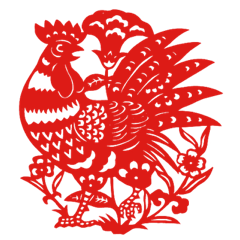 If you were born in any of the years 1921, 1933, 1945, 1957, 1969, 1982, 1993, 2005 or 2017, you are called “Roosters” in China. The Chinese New Year is defined to be the first day of the first month in the traditional Chinese calendar. Unlike the New Year on 1st January that we are used to, which is based on a solar calendar, the Chinese New Year is based on a traditional Chinese lunisolar calendar whose date indicates both the moon phase and the time of the solar year. This is why, according to the solar calendar, the Chinese New Year falls on a different date each year. Chinese New Year is celebrated in China, Hong Kong, Macau, Taiwan, Singapore, Thailand, Cambodia, Indonesia, Malaysia, Vietnam, Mauritius, and the Philippines. The celebrations usually start on Chinese New Year’s Eve and will last for around 15 days. However, our celebrations will run from Monday 23rd until Saturday 28th January to honour Grace, our amazing Malaysian Chinese chiropractor! In Chinese celebrations, red is found everywhere during Chinese New Year as it symbolizes joy, good luck, virtue, truth and sincerity. Also the sound of the Chinese word for “red” sounds the same as the Mandarin word for “prosperous”. One of the practices during Chinese New Year is giving out red envelopes containing cash. This is a form of blessing, good luck, smooth-sailing, good health and wealth and we’ll have lots of our own red envelopes to give away too! Tangerines and oranges are passed out freely during Chinese New Year as the Chinese words for “tangerines” and “oranges” sound the same as the Cantonese and Mandarin words for “luck” and “wealth”. The “Fu” character (Chinese: 福) can be easily spotted on Chinese New Year decorations as it means blessings and happiness. 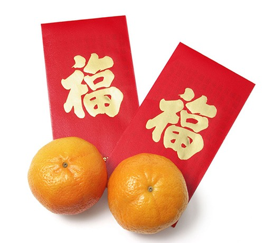 So before you leave the clinic during the week, make sure you pick up a red envelope and have a juicy tangerine or orange as our thank you and blessing of good luck, wealth, wisdom, longevity, peace, happiness and health!